Award winning designer Yasutoshi Ezumi created an exquisite Fall 2014 collection filled with architectural lines. To perfectly accentuate the collection the teams from L'Oreal Nihon and Maybelline New York created sharp bobbed hair with plaid extensions, and a clean, simple, beauty look that emphasized the models features. Style Wylde had the honor of going backstage at the collection to capture the atmosphere and action as the teams worked to create the looks. The L'Oreal Nihon team started with wigs which were trimmed and flat ironed before the models even arrived. But, even with wigs, a lot of product is on hand to help create a super smooth look (and to help keep model's own hair out of sight). 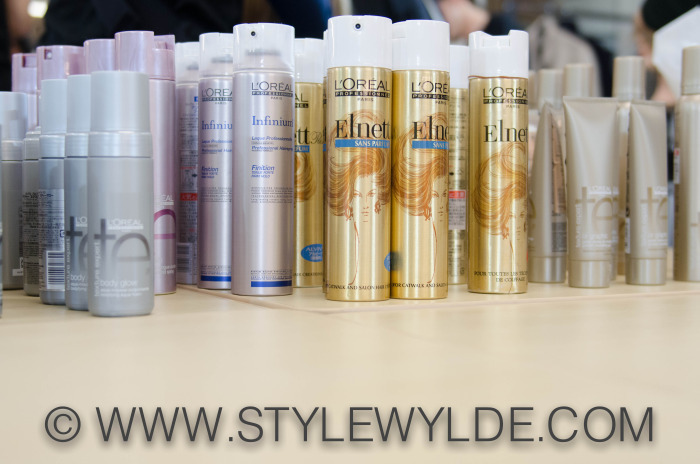 Included in the arsenal being used at Yasutoshi Ezumi Fall 2014 were, L'Oreal Mythic Oil, the entire L'Oreal Texture Expert line and of course Elnett Hairspray. 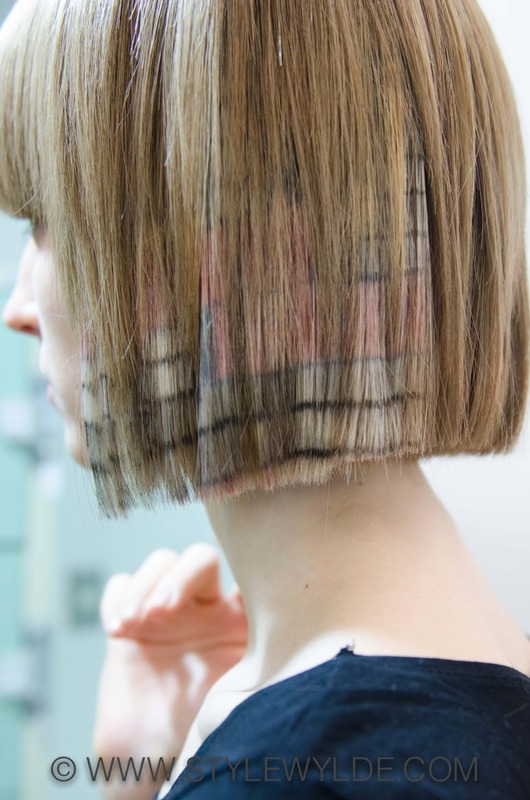 Individually created for the show, and coordinated with the individual looks, each model wore special geometric, almost Mondrian printed, extensions that were carefully added to the wigs. Once hair was perfect, models headed to the Maybelline side of the room where key artist Mizu was creating a soft and pretty, yet very modern look with a bold eye that corresponded with the looks. Here are just a few of our favorite shots from behind the scenes at Yasutoshi Ezumi Fall 2014. For more from the Yasutoshi Ezumi Fall 2014 collection, check out the Style Wylde runway feature here.